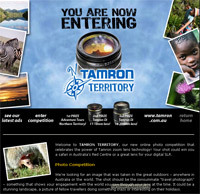 A well built standard zoom lens for DSLR cameras with ‘APS-C sized’ sensors.Tamron has tagged its new 17-50mm F/2.8 lens with the ‘SP’ label, indicating Super Performance, which puts it into the professional product category. It also bears the Di II, indicating a second-generation, digitally integrated lens that is designed for use with ‘APS-C sized’ sensors and mounts are available for Canon, Nikon and Sony DSLRs. 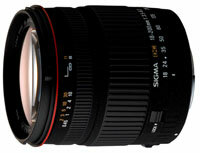 As tested on a Canon EOS 300D, it covers a field of view equivalent to approximately 27-80mm. 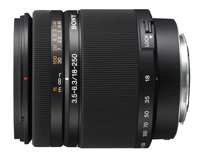 Sigma’s new 18-200mm F3.5-6.3 DC zoom lens is marginally heavier than the similarly-featured Tamron lens we reviewed in issue 25 but also somewhat smaller in size and considerably cheaper. Designed specifically for current DSLR cameras with ‘APS-C’ sized sensors (1.5-2.0 field of view crop), this lens has internal focusing, which prevents the front from rotating, making it ideal for use with angle-sensitive accessories like polarisers and graduated filters. Digital integration is now available for a popular long-range zoom lens. This professional quality, mid-range zoom lens has been designed specifically for the ‘APS-C’ sized sensors used in all of Nikon’s DSLR cameras and is quite a different beast from the 18-55mm lens supplied with the D50 camera reviewed in this issue. Covering a picture angle equivalent to 25.5~82.5mm on a 35mm camera, it maintains its fast f2.8 maximum aperture throughout its zoom range, giving it a big advantage over the cheaper optic for photographers who shoot in dim lighting and those who require a high level of depth-of-field control with differential focusing. Purchasers of Nikon DSLR cameras that come with 18-55mm or 18-70mm lenses will probably want a long zoom to extend their shooting capabilities. 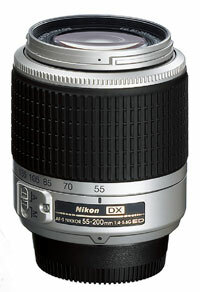 The recently-released AF-S DX Zoom-Nikkor 55-200mm f/4-5.6G ED has been designed specifically to meet this need. Available in black or silver (to match the D50), it can be used for subjects as diverse as candid portraits, sports, nature and wildlife photography. 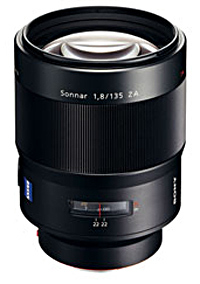 A fast, high-performance telephoto prime lens with above-average close-up capabilities.One of the first Carl Zeiss lenses to go on sale for the Sony DSLRA100 camera, the 135mm F1.8 Sonnar T* is relatively large and heavy, with a massive front element. It’s also extremely well-built, as you’d expect from a high-quality prime lens with a longish focal length. The T* designation indicates special multi-layer coatings on the lens elements to maximise light transmission and contrast. Claimed as the brightest telephoto lens in its class, it has nine aperture blades which close on a circular aperture, providing outstanding bokeh (out-of-focus blur). An extended-range zoom lens that covers a useful focal length range and provides above-average optical performance.Scheduled for release in October, at around the same time as the new Sony DSLR-A700 camera, the DT 18-250mm F3.5-6.3 zoom lens covers a 14x zoom range that is equivalent to 27-375mm on a 35mm camera. This well-built optic weighs only 440 grams and is reasonably compact. It can focus down to 45 cm to give a close-up magnification of 0.29 times. 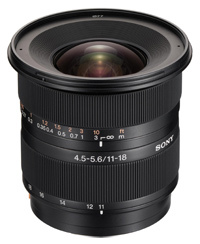 A capable wide-angle zoom lens for Sony’s Alpha DSLR-A100 camera.Sony’s DT 11-18mm super wide zoom lens represents a minor evolution of the 11-18mm lens released by Konica Minolta in mid-2005 for the Dynax 5D and 7D cameras. Its DT design is ideally suited for the APS-sized CCD imager of these now defunct models – and also for the Sony Alpha A100 camera. Used on the A100 it provides angles of view between 104 and 76 degrees, which is equivalent to 16.5mm to 27mm on a 35mm camera. This is quite wide for the smaller sensor. Tamron’s new SP AF11-18mm F/4.5-5.6 Di-II LD Aspherical (IF) lens is the company’s first ultra-wide zoom lens designed exclusively for DSLR cameras with ‘APS-C size’ sensors. Available with Canon, Konica Minolta and Nikon mounts, it is surprisingly compact. This is largely due to a new design that uses a large-aperture glass-moulded aspherical element, hybrid aspherical elements and elements made from high index/high dispersion glass and low dispersion optical glass. You pay a premium for these high-tech materials but the overall performance of this lens fully justifies its price and it remains more affordable than similar lenses from the camera manufacturers. A stabilised zoom lens with an extended focal length range that will suit many photographers who want just one lens for their DSLR.Usable with both DSLR cameras and 35mm AF-SLR film cameras, Tamron’s new AF28-300mm F/3.5-6.3 XR Di lens is designed for use with DSLR cameras that lack sensor-shift image stabilisation (Canon and Nikon). 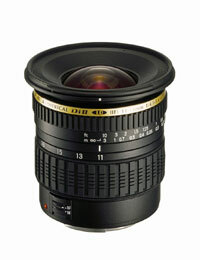 It provides an angle of view equivalent to approximately 43-465mm on cameras with ‘APS-C’ sized imagers. Relatively compact and lightweight for its class, it will attract travellers and photographers who want a single, extended-range lens with a wide coverage.